A few months ago I bought a carbon pencil at the art supply store, used it once and promptly put it away in a drawer. This evening I found it again while rummaging around and tried it again. I quite like the lines it makes, especially because with pressure you can get a really black line. Sketched on a Super Deluxe Aquabee sketchbook. The view that I picked at the Japanese Garden was a combination of man-made and natural elements. The pagoda on one end and waterfalls on the other were tied together by a lot of vegetation. I could have mixed up a big green wash and painted it straight across but that probably would have been quite monotonous so instead I chose to exaggerate the colours that I saw in the vegetation. Cool blueish-greens moved into bright yellow-greens which then changed into warm reddish-greens. In this mix there’s lots of Azo green, Quinacridone red and cerulean blue. 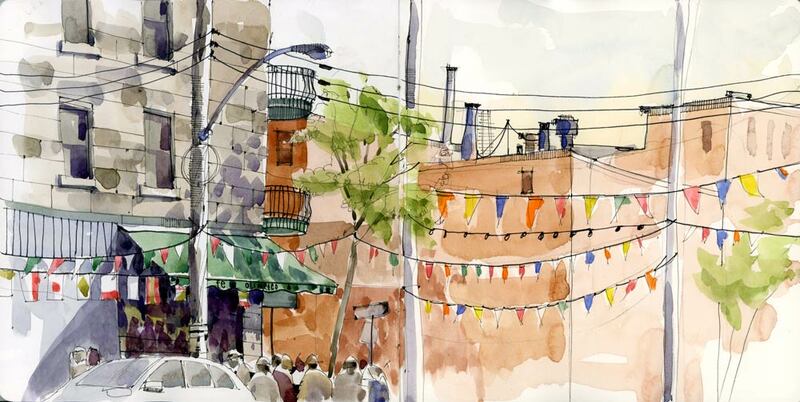 Use your sketchbook as a place to make observations. I’m often guilty of overworking my sketches but lately I’ve been trying not to worry so much about getting every line perfect, every person anatomically correct and every colour exact. 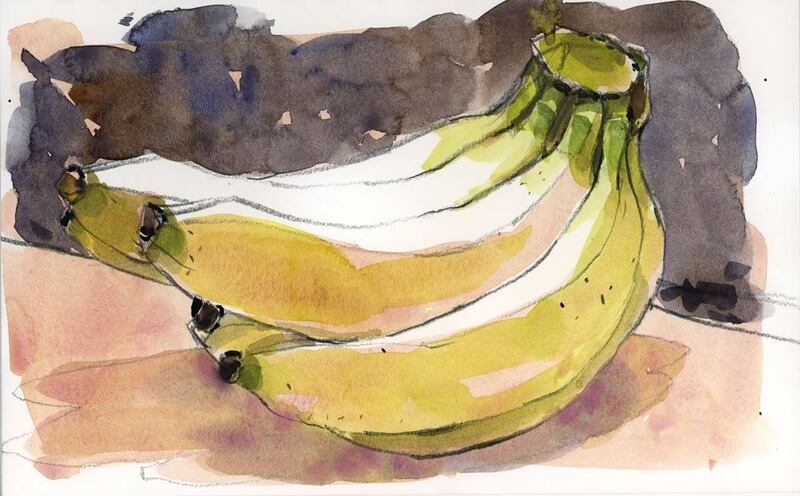 The sketchbook is a place where you should be experimenting, pushing your limits, seeing what works and what doesn’t. Have one simple goal per sketch. 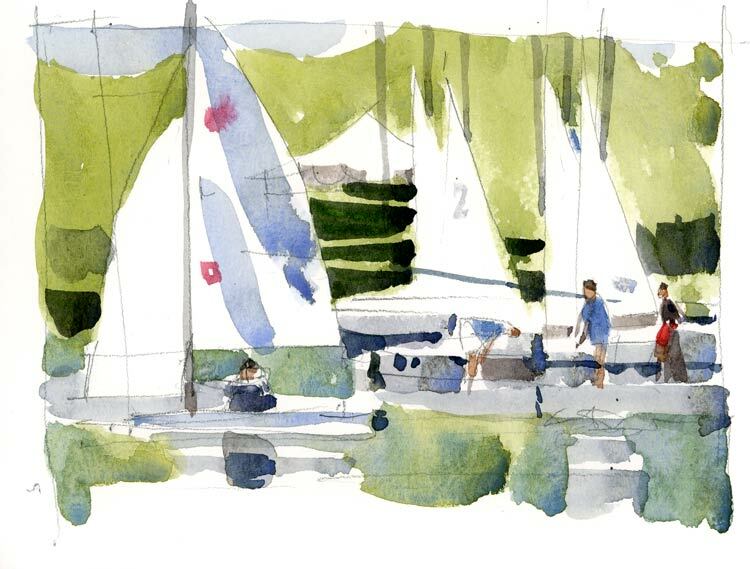 This morning I did two quick sketches at the yacht club. In the first one below, the kids were coming in from sailing class. The white sails made an interesting pattern of triangles against the trees. I drew them quickly and added in a few shapes of kids in the middle ground. Then one more boat came in and I added that too. That foreground boat made a more interesting composition and I’m glad I added it. The one goal I had for this sketch was to keep the white shapes — to paint around them — and add mostly mid-tones and a few darks around them. Even though this is a very simple sketch, I’m happy that I achieved that goal of painting quickly and capturing the essence of the scene (and the whites) in a minimum of strokes. For the second sketch my goal was to paint some simplified reflections in the water. 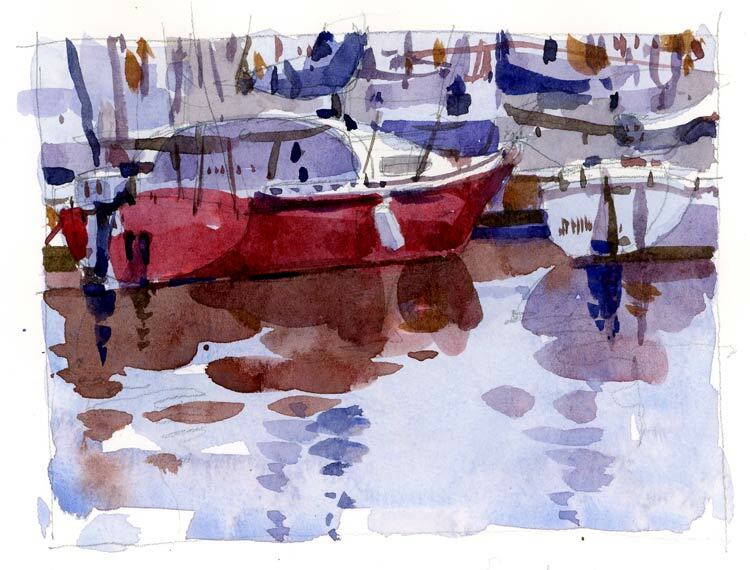 I kept the boat shapes in the upper section of the sketch so that all the complicated shapes of sails and masts and hulls would not distract me from the goal of painting the reflections.My first pass of blue wash covers everything in the sketch except the white highlights. You can’t get those back if you paint over them! Then all I did was add some details on the boats and try to simplify the reflections. BTW, these two sketches are on one page in my sketchbook but I separated them for this post. It was a mental leap when I returned from Rockport and I had to go from maritime to horticultural sketching. From all that blue to all this green! I don’t know why it was so much of a shock but it was, and it took my sketching eyes a bit of time to adjust. 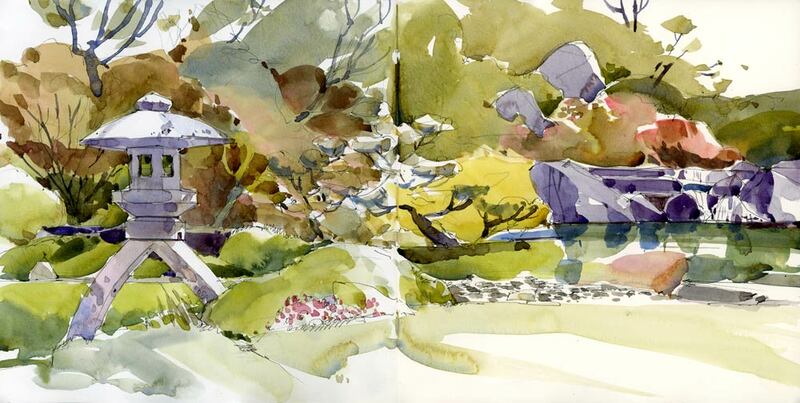 Fortunately I was in good company as this month our USk Montreal group was joined at the Botanical Gardens by Tony from the UK and Jeff from Vermont (that’s Jeff in my sketch). It’s always a pleasure to host visiting sketchers. That is, for me, one of the most wonderful things about the very large and very widespread Urban Sketchers family. 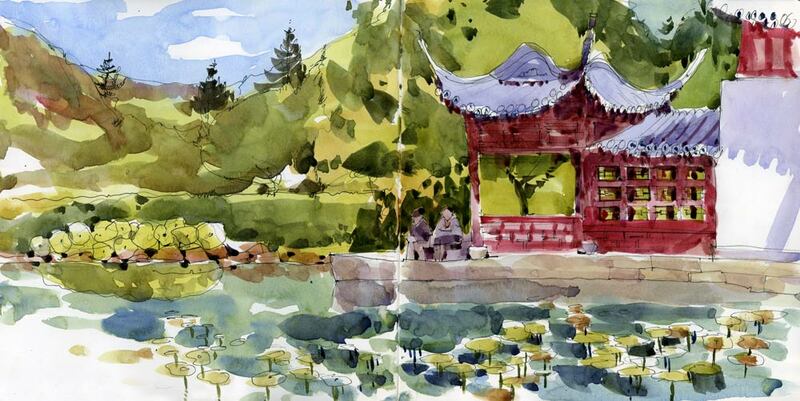 You know that wherever you travel in the world— well almost everywhere — you will find sketchers who might be willing to go out drawing with you. In fact Tony planned his visit to Canada to coincide with our monthly meeting. It’s something to keep in mind next time you travel, especially if you are reticent to sketch on your own in a new city. Check out the global directory on urbansketchers.org to find sketchers in the next place you visit. 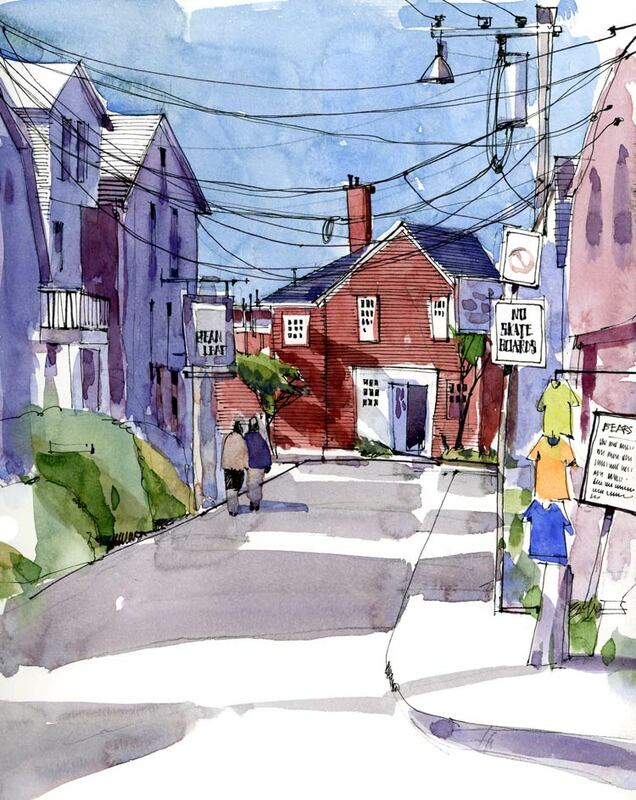 When I was drawing yesterday’s sketch of Bearskin Neck someone came up to me and said “It’s a good thing you’re not drawing the side of the street with all the electrical wires!” I found that pretty funny since I love drawing wires and utility poles. Some people may find these unsightly but I think they give a rhythm to the drawing and they often echo the curves found in other parts of the picture. Sometimes they add a contrasting note when there are a lot of verticals and horizontals. Or in this case they add a little bit of disorder to a scene that might otherwise be a little too pretty. 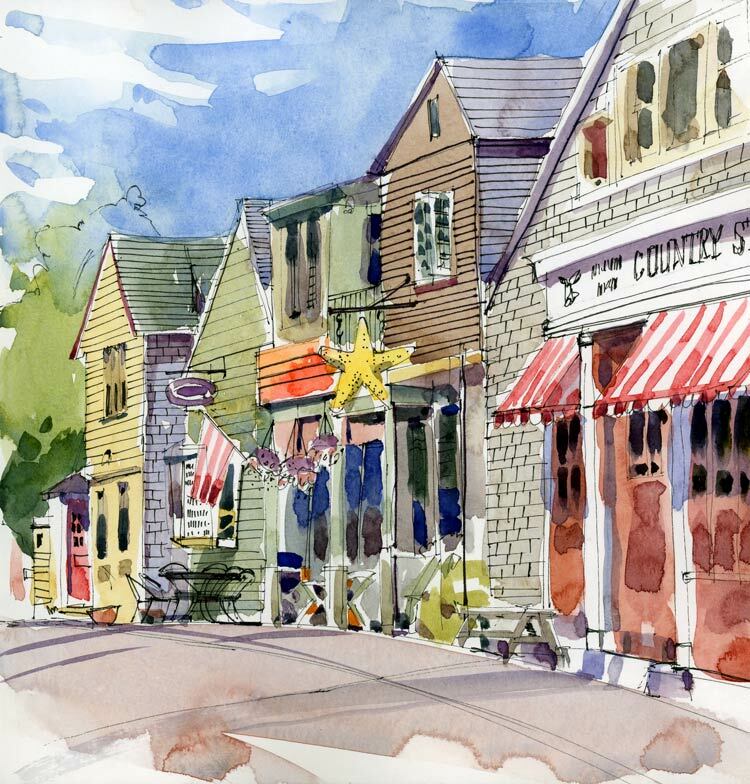 It would be impossible to sketch on Bearskin Neck in the middle of the day —there’s just too much pedestrian traffic and the street is too narrow. But it’s the reason why people go to Rockport. To walk up and down this street with their kids and dogs, to eat lobsters and fudge (hopefully not at the same time), to buy souvenirs and to check out the art galleries. On Father’s Day there was no parking to be found within a mile of the centre of town. Rockport seems to be a place mostly for day tourists and that’s what makes it attractive to me. In the morning and evening the place clears out and then I can set up anywhere and sketch all the little buildings. In a sketch like this I usually start by looking at the line of the roofs against the sky. Once those are in I can add the detail of the structures, and lastly all the colourful accents.